The Green New Deal has high ambitions and high costs, but the mechanisms for covering those costs already exist, and they pale in comparison to the cost of doing nothing. Here’s how the Restoration Economy already works. 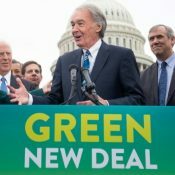 8 February 2019 | Freshman Rep. Alexandria Ocasio-Cortez (D-NY) and veteran Sen. Ed Markey (D-Mass) lit up the internet this week with their proposal for a “Green New Deal,” which does what US negotiators refused to do at recent climate talks in Katowice, Poland: namely, it recognizes scientific consensus on the need to reduce emissions and increase carbon sinks, and it sets ambitions based on it. These are exactly the kinds of natural climate solutions that can deliver more than one-third of the mitigation needed to meet the Paris Agreement’s 2-degree target, but which get just 3 percent of dedicated climate finance. Naturally, critics on the right have gone apoplectic, claiming that the proposals will slash fossil-fuel profits, killing jobs in the process. Those gripes, however, miss some basic economic realities: beginning with the fact that that profits aren’t jobs. In fact, they’re often the opposite: companies save money by cutting jobs. 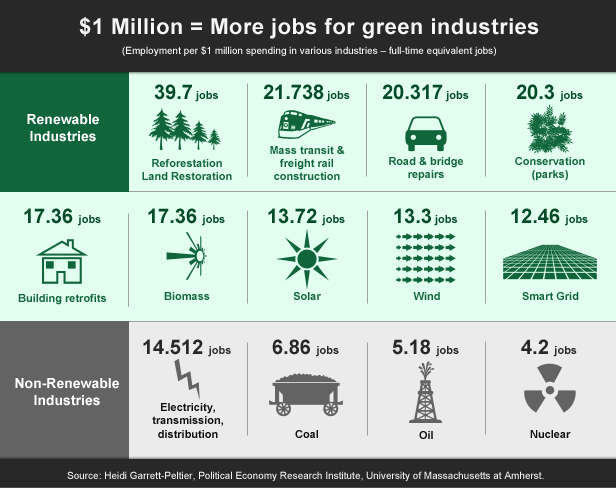 Now, cutting jobs can sometimes benefit the economy if those jobs aren’t adding value, but the jobs that the New Green Deal generates do add value by paying farmers to plant trees and use winter cover crops that improve soil fertility and provide raw materials for biofuels. They also pay ecosystem entreprenerus to restore rivers, and to turn soggy, unproductive land into wetlands that filter water, purify air, and slow climate change – jobs that exist because companies that damage our environment have a responsibility to make us whole. This isn’t pie-in-the sky. Those jobs are already part of a $25 billion “restoration economy” that directly employs 126,000 people and supports 95,000 other jobs – mostly in small businesses – according to a 2015 survey that environmental economist Todd BenDor conducted through the University of North Carolina at Chapel Hill. 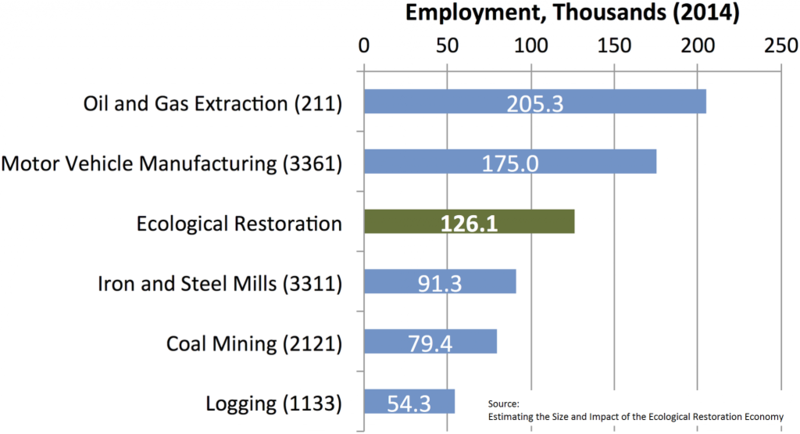 The restoration economy is already providing jobs for loggers across Oregon, and even some coal miners in Virginia, but it could disappear if the GOP environmental rollback continues. Here are 11 things you need to know to understand it. The restoration economy is not to be confused with the renewable energy boom that employs 374,000 people in solar parks and 101,738 on wind farms. Like those, however, the restoration economy is part of a burgeoning “green economy” that’s transforming forests, farms, and fields around the world. State and federal governments helped the wind and solar sectors get off the ground, but both of those sectors are humming along on their own now because they provide a cost-effective way to produce electricity, which everyone needs. The demand for restoration, however, isn’t as automatic as the demand for electricity is, because most companies and even some landowners won’t clean up their messes without an incentive to do so. Economists call these messes “externalities” because they dump an internal responsibility on the external world, and governments are created in part to deal with them – mostly through “command-and-control” regulation, but also through systems that let polluters either fix their messes or create something as good or better than what they destroy. Pioneered in the 1960s, environmental markets offer flexibility in meeting commitments. That local government mentioned above, for example, can either restore the land itself, or it can turn to a “conservation bank”. These are usually created by green entrepreneurs who identify marginal land and restore it to a stable state that performs ecosystem services like flood control or water purification. They make money by selling credits to entities – personal, public, or private – that need to offset their environmental impacts on species, wetlands or streams. The federal government – especially the military – holds itself to high environmental standards, as do many states. Government activities alone support thousands of restoration jobs. Government agencies are big buyers of credits, often to offset damage caused by infrastructure projects, but the link between infrastructure and restoration goes even deeper than that. In Philadelphia, for example, restoration workers are using water fees to restore degraded forests and fields as part of a plan to better manage storm runoff. In California, meadows and streams that control floods are legally treated as green infrastructure, to be funded from that pot of money. “Green infrastructure”, it turns out, is prettier than concrete and lasts longer to boot. Trump wants to “expedite” infrastructure roll-outs, and he can do so without weakening environmental provisions by removing unnecessary delays in the permitting process (see point 11, below). Nature is complex, and rigid regulations often fail to address that complexity, as environmental economist Todd BenDor makes clear when he points to regulations requiring the placement of silt fences in new subdivisions along waterways. In 2015, BenDor published a study called “Estimating the Size and Impact of the Ecological Restoration Economy”, which found restoration businesses in all 50 states. California had the most, but four “Red” states filled out the top five: Virginia, Florida, Texas, and North Carolina. Last place went to North Dakota. By their very nature, restoration projects are located in rural areas, and a study by Cathy Kellon and Taylor Hesselgrave of EcoTrust found that Oregon alone had more than 7,000 watershed restoration projects, which generated nearly 6,500 jobs from 2001 through 2010. Many of those jobs went to unemployed loggers. 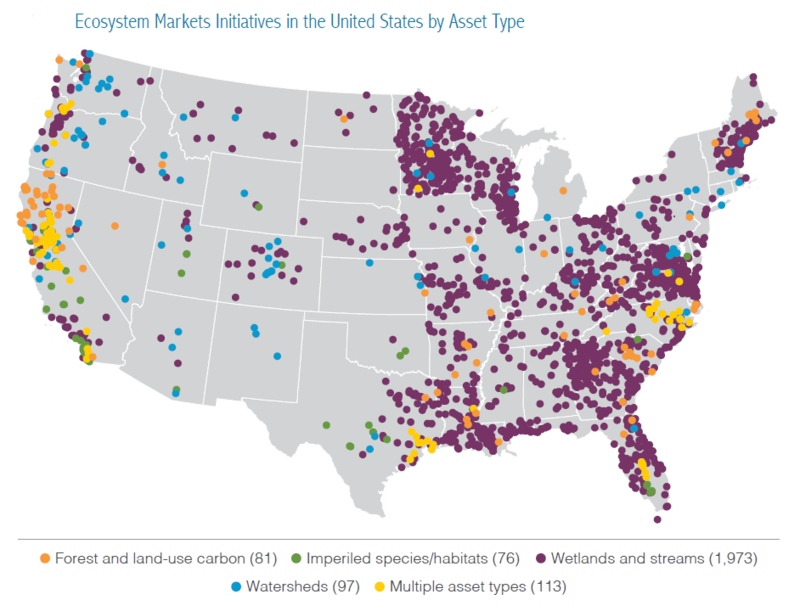 Last year, the US Department of Agriculture’s Office of Environmental Markets, together with Ecosystem Marketplace publisher Forest Trends and the Environmental Protection Agency, published an online Atlas of Ecosystem Markets, which you can access here. Environmental regulations didn’t kill coal; natural gas and renewables did. Regulations didn’t stifle the western oil boom, either; that was low energy prices. Even if Trump & Co do prop the coal sector, jobs won’t go to people; they’ll go to machines, which took most of the jobs America lost in the last decade. BenDor’s research shows restoration jobs are evenly divided between white-collar planners, designers, and engineers and the green-collar guys doing the actual earth moving and site construction. Even proponents of the system concede, however, that the permitting process is slow and tedious. While the FWS administers credits for mitigation of endangered species, the Army Corps of Engineers approves mitigation credits for streams and wetlands, and they’re notoriously underfunded. This leads to long and costly delays, according to unpublished research that BenDor conducted with Daniel Spethmann of Working Lands Investment Partners and David Urban of Ecosystem Investment Partners. Delays are so costly, they argue, that companies in the restoration sector might be better off paying 50-fold higher permitting prices that would give the agencies the staff needed to properly process permits, akin to expedited building permits, rather than paying banks the interest on loans for land where environmental improvements are being held up. This story is adapted from a piece we ran in 2017. Click here to view the original.